What is love? For me it’s teaching your children how to take good care of themselves and show them how to cook with attention and passion. So this weekend I’ll spend some time in the kitchen with my two daughters to make wonderful healthy things based on nut milk: chocolate truffles (made with the leftover nut pulp of nut milk) and smoothies. If that ain’t love! Today we’ll share the recipe for raw almond cashew milk, tomorrow we’ll post delicious sunshine smoothies with mango, ginger, and turmeric. You can make nut milk from any kind of nut, you can even add sunflower and pumpkin seeds. I tried a couple of combinations and for me a mixture of almonds and cashews works best. The cashews make the milk extra rich and creamy. Making your own nut milk is an easy job. The only con is its shelf life: it can become rancid in a couple of days. I’ve had this several times, so I started to make smaller batches. Also, I make sure every item that comes into contact with the milk is very clean and I use sterilized bottles for storing. Obviously, the quality of the nuts is also important: do nut use nuts that taste rancid or bitter. Oh, and don’t throw away the nut pulp after preparing the milk, it makes for delicious chocolate truffles (see recipe below). 1. Put the nuts with the salt in a bowl and add the water. 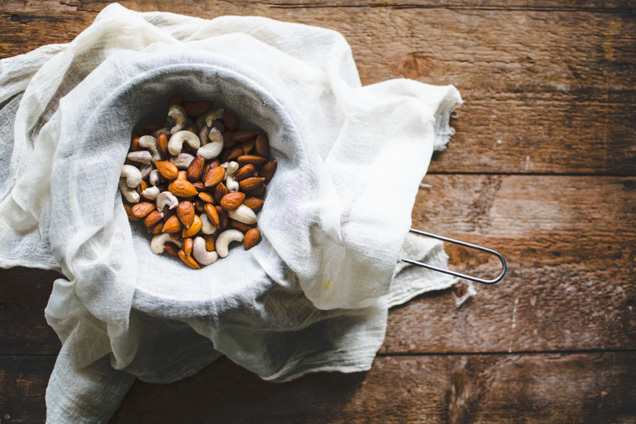 Cover and let the nuts soak in the fridge for at least 4 hours (but you can also soak them overnight). 2. Purée nuts and the soaking liquid in a blender for a couple of minutes until very smooth. 3. 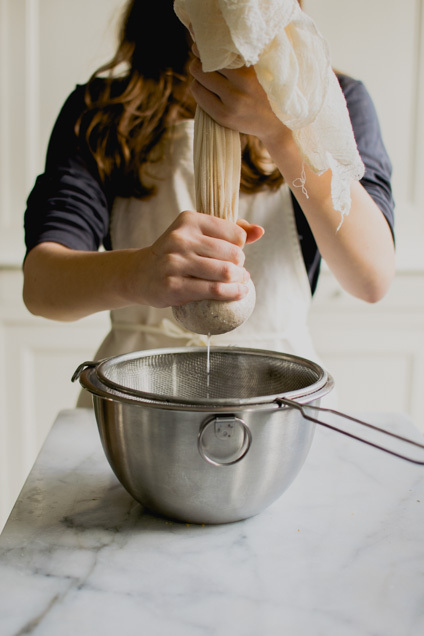 Line a strainer with cheese cloth and place over a bowl. Pour the nut mixture into the strainer. Gather the cheese cloth and squeeze the milk out, use some effort to squeeze out as much milk as possible (see picture with daughter Flo). Pour the milk in a clean bottle and store immediately in the fridge for 3-4 days (or drink it). 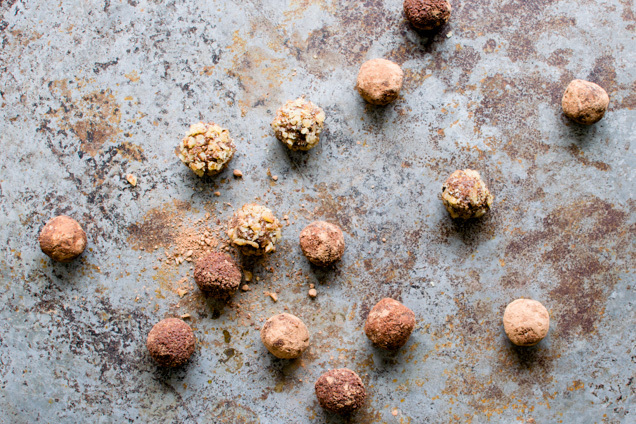 Save the pulp for making truffles (see recipe below). Note: I don’t like to sweeten my milk, but feel free to add some maple syrup or honey. You can also add a few drops of vanilla extract. I like to add orange zest, but you can add ½ tsp cinnamon or vanilla extract instead. 1. Blend all the ingredients in a food processor until they turn into a paste; taste the paste and add 1-2 more dates if you want it to be a bit sweeter. 2. Take small amounts of the mixture and roll them into 18-20 small balls. 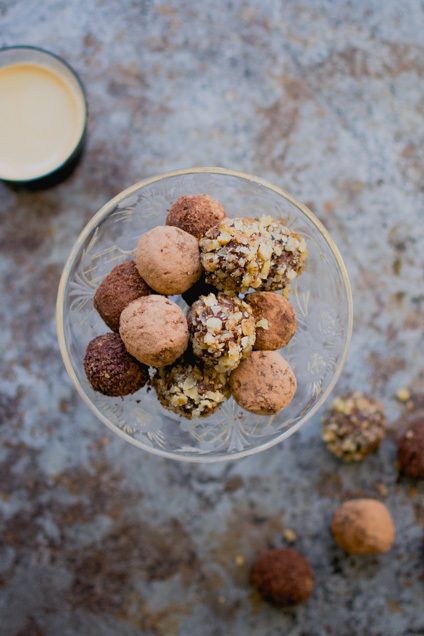 Coat the truffles with anything of your liking: toss it in coconut, cocoa, grated chocolate, cinnamon, chopped nuts or hemp seeds. Store in a container in the fridge. What a wonderful way to spend a sunday afternoon. Doesn’t everybody want a mother like that?